To serve as a resource for University Hospital and its administration regarding the provision of sedation to children outside the operating room. As parents and other medical consumers become increasingly educated, the subspecialty of pediatric anesthesia has gained increasing recognition. A plethora of studies have shown superior pediatric surgical outcomes when the anesthesia for those surgeries is provided by a pediatric anesthesiologist. As a result, parents are requesting service from members of the division directly or through their referring surgeon. Widespread access to the Internet has also increased parent's awareness regarding the importance of pediatric anesthesia. Team members are also available to consult on pediatric patients needing respiratory support and pain management. 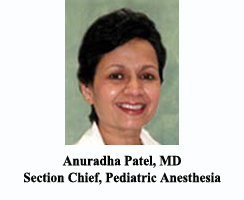 Clinical opportunities for the practice of pediatric anesthesia abound in pediatric surgical subspecialties at University Hospital and Hackensack University Medical Center. The following pediatric subspecialties are represented: Ear, Nose, and Throat, Plastics, Orthopedics, General, Ophthalmologic, Neurologic and Trauma Surgery. Additionally, Pediatric Anesthesia services are available to practitioners in the Divisions of Pediatric Dentistry, Pediatric Oncology, and Pediatric Radiology. Cases are distributed along a spectrum of illness severity, so clinical case requirements for the American Board of Anesthesiology are easily met. A clinical case conference is given every other Tuesday afternoon which covers the ABA content outline fully over a two-year time period.